The Benchmade Griptilian is practically a household name in the knife world. It is one of Benchmade’s most popular designs and it appears in countless variations. And for each of these variations I know there are countless reviews, but this knife has some sentimental value to me so I cant resist express my opinions on it. The Griptilian was one of my first “real knives” when I got into owning higher grade production blades. Years later and it still remains among my favorites to this day. The full size Griptilian has an overall length of 8″, a 3.45″ blade, weighs 3.25 ounces, and is made in the USA. This isn’t a small knife, but Benchmade has managed to keep the weight down (mostly due to the handle design which I will cover below). The Mini Griptilian has a a 2.9″ blade, an overall length of 6.78″ and a weight of 2.56 ounces. I actually purchased a Mini-Grip first, but I ended up swapping it out for a full size because I wanted something with a full size handle. I know a lot of people who prefer the Mini-Grip for an EDC knife – it’s all a matter of preference. Depending on whether you are looking at the thumb hole version or the thumb stud version the knife will have either a sheepsfoot blade with a thumb hole or a drop point blade. Both blade shapes come in 154CM stainless steel and both blade types will have a long hollow ground edge with plenty of belly. The drop point edge is very attractive to me, so that is what I ended up purchasing. It has a swedge that finishes in a fairly stout tip – good for piercing tasks. The knife was extremely sharp out of the box. All in all this is a very nice blade which is great for EDC chores. The standard Grip comes in 154CM. 154CM is a highly regarded stainless steel manufactured by Crucible in the USA. While fancier (more expensive) steels have come on the market in recent years, I still appreciate 154CM because it takes a nice edge and is easy to sharpen. I actually prefer 154CM over S30V in many applications because 154cm is so easy to maintain. This is a proven steel and is a good fit for a working man’s knife like the Griptilian. The handle of the Griptilian is made of Valox, which is an injection molded high density resin. It’s plastic. I know some people don’t care for the Valox handle because it has a lightweight and the plasticy feel. Personally, I think it is a practical choice for the handle as the material is both lightweight and tough, but I understand how fans of more substantial knives could be turned off by the product. After years of people complaining, Benchmade finally issued a G-10 version of the Griptilian and Mini Grip in late 2015. I still like the original plastic handled version, but the G-10 version is beautiful and definitely an upgrade. Check out my review of the G-10 Griptilian here. This handle has a closed back design, which means it is a little more difficult to clean than a knife with pillar construction. The handle is held together with screws and everything is nicely finished. Benchmade makes a ton of these knives and they seem to have their manufacturing and quality control protocols dialed in. As far as ergonomics are concerned, the handle is chunky and covered with texturing. I would expect no less from a knife called the “Griptilian”. There is a run of jimping on the spine of the blade, and little jimping in the plastic placed strategically around the handle. The knife feels good in the hand and there is no lack of traction. I have used my Griptilian for years now and it continues to be a solid performer. The Griptilian comes with Benchmade’s standard steel pocket clip. The clip is a classic no-nonsense design that has stood the test of time and can be found all over Benchmade’s lineup. The handle is drilled and tapped for ambidextrous tip up carry. All in all this is one of my favorite clips. It has great retention, buries deep and looks normal. The only potential issue is that the black finish will quickly began to wear. That is not an issue for me, and if you send the knife in for sharpening, Benchmade will include a new clip. I will say that while the Griptilian is lightweight for its size, this is a thick knife. At over half an inch thick you will likely notice it in the pocket. Whether you opt for the version with thumb studs or the thumb hole, the Griptilian deploys with alarming speed. Seriously, this is one of the fastest deploying and smoothest opening knives I own and it’s one of my favorite features of the knife. I’ve taken mine apart for cleaning a couple times, and Benchmade has installed some of the biggest phosphor bronze washers that I have ever seen on a folding knife. No doubt this is part of the reason why deployment is so smooth. The Griptilian uses Benchmade’s axis lock which I have written about quite a bit in the past. It’s an excellent lock and it really works well with the Griptilian. There is a lot of weight in the blade which makes it easy to really flip the knife out fast and it makes for a solid lockup. Also, the axis lock gives you a variety of ways to open and close the knife. I find myself playing around with the deployment of this knife a lot. It’s a durable locking system that allows the knife to easily be open and closed with one hand. As I mentioned in the handle section, Benchmade released the 551-1 G10 Griptilian in 2015. This was after years of people complaining about the plastic handles of the original 551. I have both the G10 and regular version, and wrote an in-depth review of the 551- that can be found here. The G-10 version is awesome, but it’s also about $100 more than the regular version. Naturally, people want to know if the G10 version is “worth it”. I can’t really answer that, because everyone is different and value is relative. Some people will see the value in the G-10 version, some people wont, and some people won’t even see the value in the regular FRN Griptilian. I will say that the 551-1 is immaculate. Benchmade did an absolutely beautiful job with the knife, and I can easily see where the extra money went. They didn’t just slap on some G10 handles, they considered every aspect of the original Griptilian and tweaked it when building the 551-1. It’s a wonderful knife. If you have the money and interest, then my suggestion is to spring for the G-10 version. With that said, the original 551 is still as serviceable as it ever was, and remains one of my all time favorite pocket knives. At the end of the day, both the full size and Mini Grip are excellent knives. I can easily justify having both in my collection. With that said, if you have to pick one, then my blanket advice would be to buy the mini-grip if you plan on carrying it in a suburban environment (ie, if you plan to use it at work, and you work in an office). The full size Griptilian is a good size knife, and some will consider it threatening if you use it in public. If you can get away with carrying a bigger knife and like bigger knives, then go for the full size Griptilian. The Griptilian has a well deserved reputation of being both an outstanding pocket knife, and a modern classic. Benchmade started with a timeless and functional design, and built the knife to be lightweight, fast, and functional. The thickness of the handle, and choice of plastic will be turn offs for some, but personally I like how the the knife feels in hand, and have no problems with the choice of handle material. And these days we have the G-10 551-1, so if you don’t like the black plastic, go for the G-10. My Griptilian has seen years of use, and it still finds a lot of time in my pocket. This is my highest form of endorsement. I have owned my Griptilian since 2011, and I still have it in my regular rotation. This is after reviewing hundreds of pocket knives. Over that course of time I have bought and sold dozens and dozens of knives. I still have my Griptilian and I still use it. That alone should tell you something. I recommend the Griptilian if you are in need of a larger EDC knife or utility knife. If you are looking for a smaller knife, then check out the Mini Grip. Both are great. If you want something higher end, then go for the 551-1, or the 556-1. At this point there is something for everyone in the Griptilian lineup. You can’t go wrong with the Griptilian. I recommend purchasing the Griptilian from Amazon or BladeHQ. Buying anything through any of the links on this helps support the website commission (at absolutely no cost to you). Any and all support is greatly appreciated – thank you very much! Classic knife with an awesome lock. I don’t love the grind, but it will do the job. FFG or high hollow grind would be better than the Grip’s low primary grind. As for the secondary grind, it is very clean, but I always think Benchmade makes them too shallow. Your Griptilian is the thumbstud-equipped Model 551. I think the version with a Spyderco-like thumb hole (Model 550) is the best overall choice. Between the thumbhole and the multifariously “flickable” Axis lock, you get amazing deployment options for a manual knife. One great thing about the Grip as a tactical knife is that Benchmade makes a high quality, factory trainer (blunt practice knife) for the thumbhole version (550T). I’ve played with one, it’s excellent. There used to be a thumbstud version trainer too (551T); don’t know if it’s still being made. Anon thanks for stopping by and offering up another awesome comment. My Griptilian actually got some pocket time today. This is a go-to tactical knife for me and pairs nicely with a smaller EDC blade. I agree, the secondary grind on Benchmades are typically too thin for my taste. I had to send my Grip in for their lifesharp program and they put a nice fat secondary bevel on it – thing cuts like a laser now. I agree that the thumbholes are slightly more practical, but I love the look of the thumb studs on this one and the knife is the smoothest, fastest deploying blade I own. I have no trouble with the thumbstuds, but I know a lot of people vastly prefer the thumbholes (and for good reason). I did not know they made a trainer, that is a big plus if you are serious about using this kind of knife to it’s fullest capacity. Thanks Drew! I need to give the 550 a chance. I have always loved the look of the 551, it has kept me from exploring the 550. I’ll have to fix that down the road. I tend to feel that thumb holes are more practical than thumb studs, but sometimes I choose form over function. 🙂 Thanks for reading. 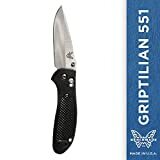 After buying a few Spydercos, I ordered the Benchmade Griptilian after hearing SO much hype about it and watching countless YouTube reviews. The 551 is more than I expected, just an incredible knife and to me just perfect. I doubt any knife of its size can feel more solid, the Axis lock is smooth perfection. It seems to me that Spyderco excels in ergonomics, and Benchmade does the same in build quality, both are awesome knife manufactures. Thanks for dropping by and offering some thoughts, Darren. I am very happy to hear that you are enjoying your Griptilian. This is one of my first high end knives and I still carry, use, and enjoy it. Hope yours stays in the collection for a long time. After picking up the Griptilian, my view on folding knives has changed, this 551 seems like the ultimate in American made ingenuity! I’ve got a Paramilitary 2 on back order (big surprise! ), then it’s on to more Benchmades in my collection. Thank you, Darren. I think you will enjoy the Para 2 if you like the Griptilian. I like them both quite a bit. I look forward to hearing your thoughts on it. Glad to be on board, seems like an awesome forum to share our interest as knife lovers! I know this is an older review, but I would like to comment any way. I own two Benchmade knives, the Griptilian and Mini Barrage. I wouldn’t hesitate to recommend Benchmade to anyone in the market for a quality edc knife. Thank you for the review, keep up the good work. Thanks for stopping by and for your thoughts on the Griptilian. Although this is an older review, I still carry and use both my full size and mini grip. It continues to be a staple in my rotation and an excellent knife. I can tell that Benchmade knives are built to last. Before I owned a knife equipped with the axis lock, I was a little concerned about the durability of the axis lock spring. I have read comments about the springs breaking, so I bought another Benchmade for back up just in case , I have heard of some springs lasting more than 10 years. Have you had any trouble with yours? No, no trouble at all with any of my BM’s omega springs. I have had some of the knives in my collection for 5 years at this point. Will be buying a Benchmade in near future. it will either be this Griptilian or a push button automatic. I have a couple of models in mind. But, onto this Griptilian…. Please explain to me the pros and cons of the thumb “hole” opening vs the thumb “stud” opening. I appreciate all of you and your knowledge and experience. Thank you. Hmm, I would say the pro to going with the thumb hole is it’s easier to manipulate, especially with thumbs. The con to the thumb hole is that it may look kind of goofy. But from a purely practical standpoint I would select the thumb hole. Hope this helps. Thanks for the comment and kind words. Hello Dan and Darren: Thanks for the interest and quick reply. Any input from you gentlemen or other readers is very helpful to me. If I decide on the Griptilian I would go with the thumb hole as I am in the Catskill Mts in summer and Florida in winter, hence no gloves. Living in the northeast, thumb studs are a MUST while wearing gloves from November till March. Winter months call for a Griptilian or Ontario Rat 1 for me anyway. Interesting, Darren. I have heard most people say that the thumb hole is better for gloves. Living in FL I don’t get to wear gloves often (at all). I prefer the look of the version with thumb studs. Richard, first of all good choice I believe stepping up to Benchmade! Automatics are cool and all but believe me when I say your Griptilian , once worn in, flicks open super easy. The Griptilian feels slightly wider than some others, which I prefer. Of the many knives I own, the Grip end up in my jeans almost always. Spydercos Paramilitary 2 is also worth picking up, fits the hand like no other, opens easy and has an amazing compression lock that’s ingenious. Good luck with your choice, the Griptilian will last long and serve you well for many years! Darren…. Thanks will reply in @ a week. heading south. I have a griptillian I picked up back in 2004. Interestingly the blade is made from 440c, not 154cm like my other Benchmades. I’m sure it’s not a knock off, as I purchased it from an AAFES in Kuwait. It’s still a great knife, I carry it at least on occasion. I recommend it to anyone. It’s a great American made knife and probably the most affordable in Benchmade’s line up. I really enjoyed your review and analysis of these two great knives (I have one of each) and they are both excellent tools with strengths of their own and you did a good job of highlighting these as well as some areas not as strong. Reading about the many excellent knives just makes me want to check out new areas and brands I have never owned. As an example I just brought my first ZT brand knife (a 350) and I am enjoying it so much I have to talk myself into NOT carrying all three at the same time (just kidding) but I wanted to let you know how much I enjoy your writing…..please keep up great good work. Thank you for the very kind comment. I really appreciate it. There are a lot of great knives out there, and if you aren’t careful it’s easy to slide down the slippery slope of knife collecting. I am very happy to hear you have been enjoying the reviews and website. I assure you that there are many more to come. I am planning to buy a Griptilian in the new -1 style mostly because of the steel and sweet looks as the G10 isn’t that big of a deal to me, but Iwasn’t sure about full size or the mini, this video brought up some great points, especially the point about freaking others out at work flipping open the full size one. I had the older style full size Griptilian and got some strange looks from other co-worker city folk! Long story but I lost my old Grip and cried for a week since I loved it so much. I do remember that the full size grip seemed kinda wide and bulky in my pocket. From the video the blade on the mini doesn’t seem too small for my needs but I guess the true test would be to go and hold both to truly know which one but I am seeing the possibility of wanting both becoming a reality! Do you know with the new G10 ones if the mini is also narrower than the full size like the old style? Thank you for stopping by. I am glad you enjoyed the review. Yes the G-10 mini Griptilian is about a tenth of an inch thinner, like the FRN versions. I still carry both my full size and Mini Griptilian quite a bit. The mini is excellent for EDC and when you need to be a little more discrete. Me ha gustado mucho tu trabajo, he leído completamente tus comparaciones y análisis. En dos dias mas compraré el Griptilian 551 con tetones pues me encantó el grip en mi mano, además que la versión con orificio no es hermosa para mi. Andrés, Muchas gracias por la complimenta! Me alegra que te guste el sitio web.